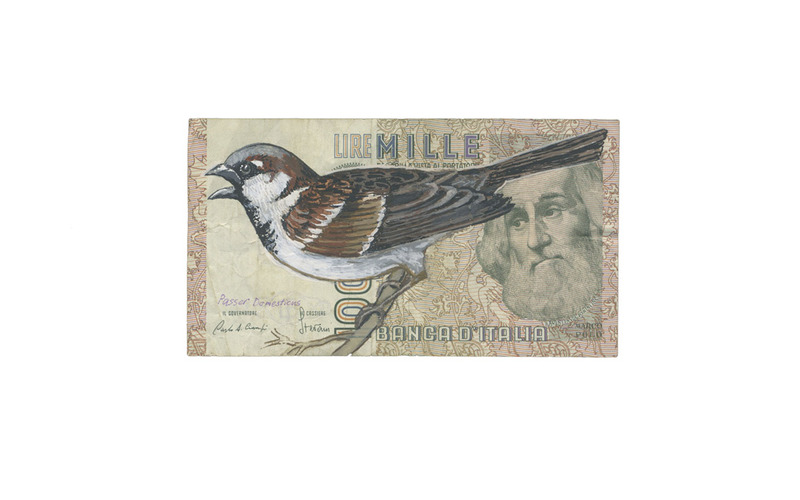 As an artist, currency is my medium of exchange with you. 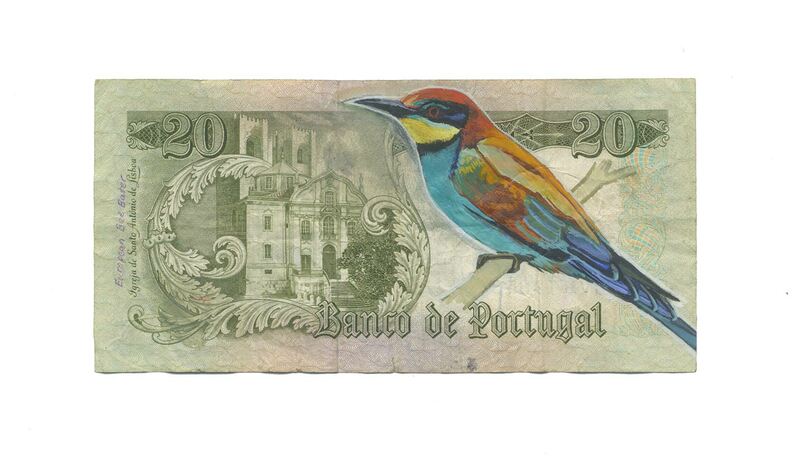 My currency is painting and drawing, my mind, ideas and spirit. 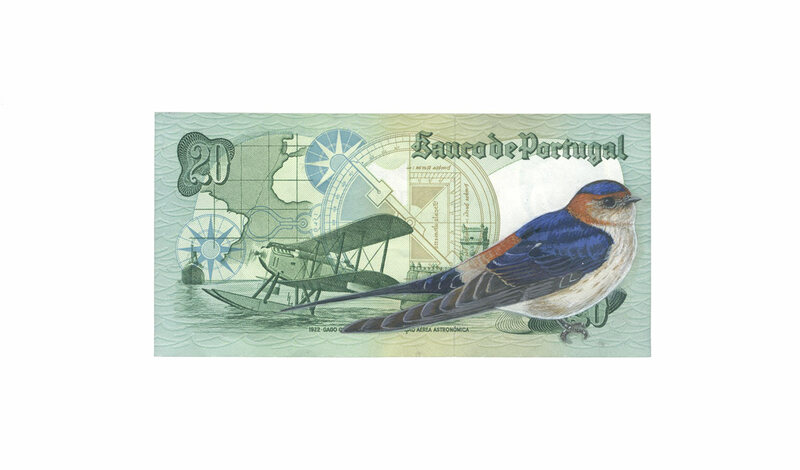 Money is what is there, currency is what I have added. 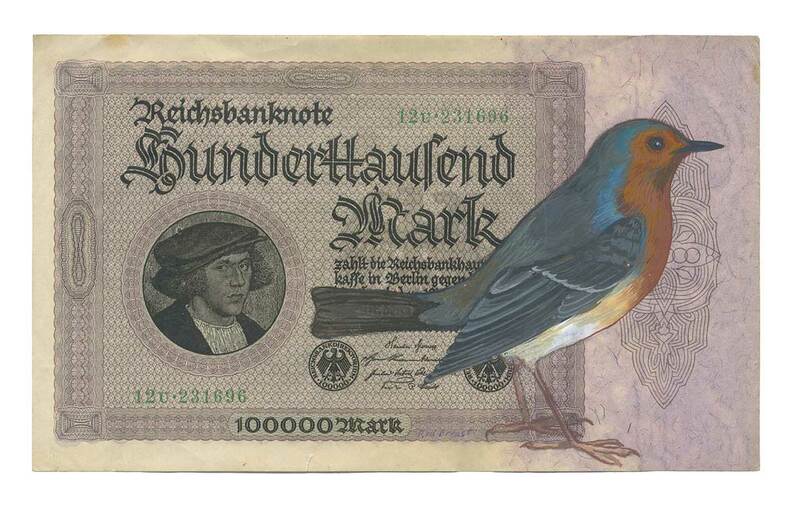 Painting on money gives me some power to determine (rather than be controlled by) money’s function within society. 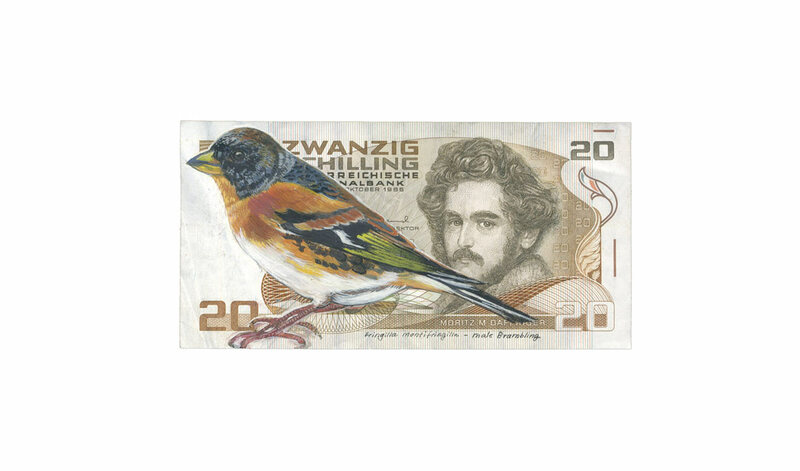 This relates to the concept of agency; it explores the extent to which we have the power to define (rather than be defined by) the currencies in our culture. 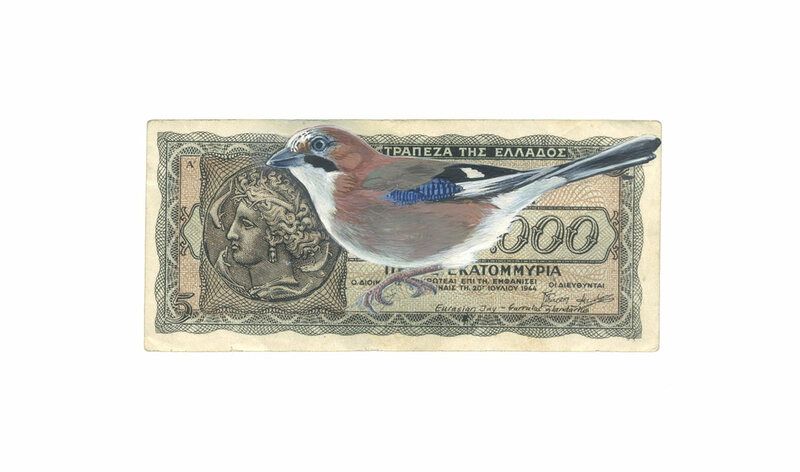 medium: watercolor and gouache on defunct Greek paper currency. Please click arrows > to see subsequent examples from this series. 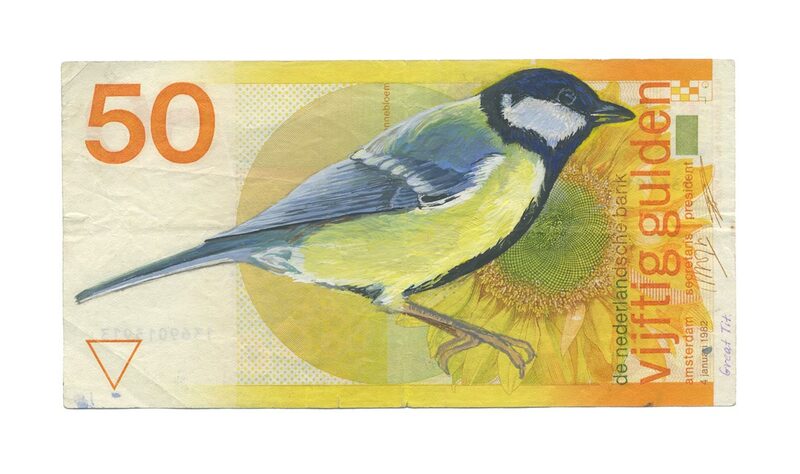 My love of birds and ornithology is the point of departure for this recent series of currency work. 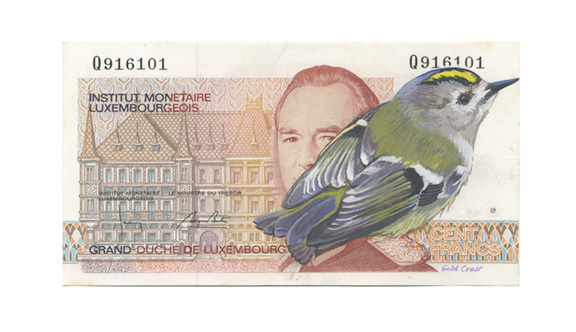 The contribution of global economics to climate change is deeply disturbing and is altering and destroying some of the habitats that migratory birds depend on. 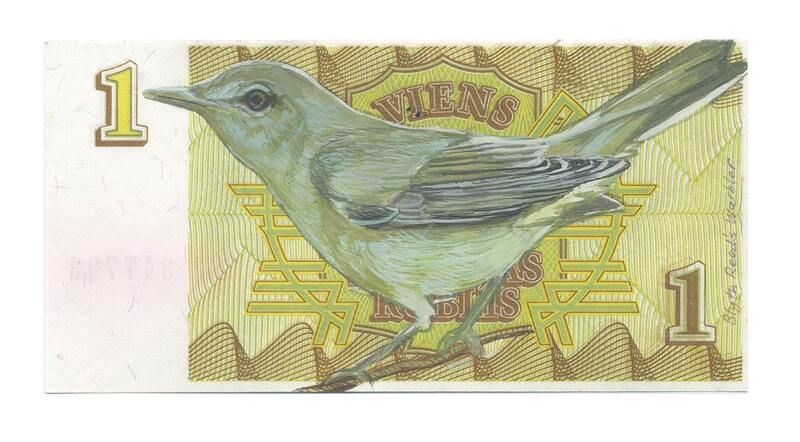 Birds and other life forms are the, so-to-speak, “canaries in the coal mine”. 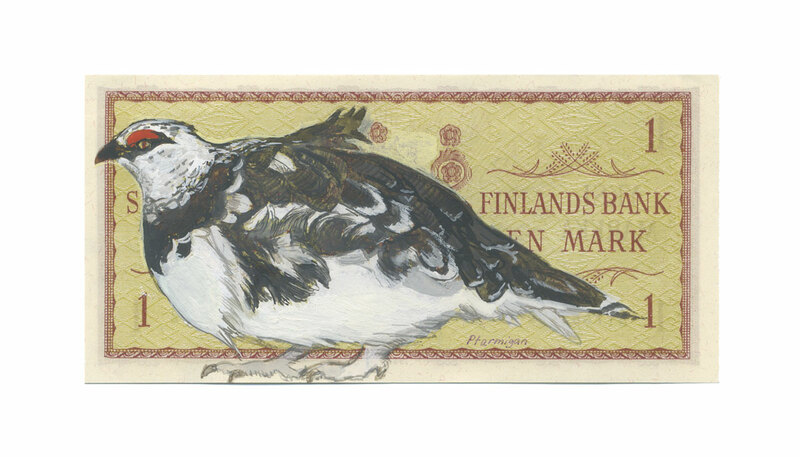 In many early cultures birds were seen as messengers, and were venerated for their ability to foretell future events. 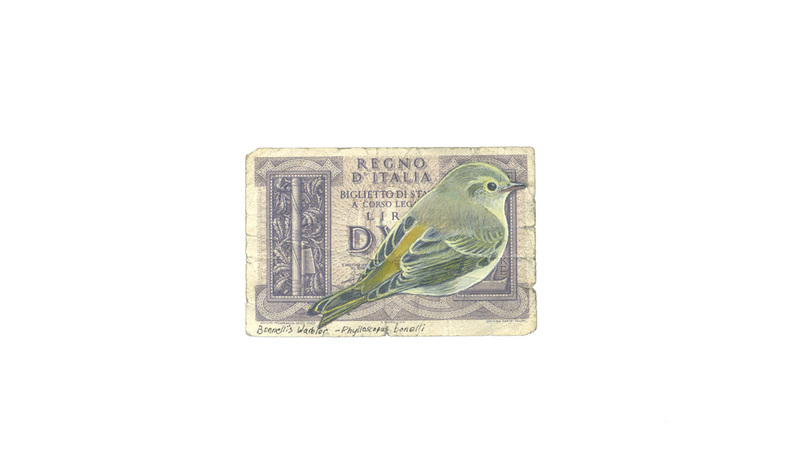 Many bird populations are declining worldwide and Bird Life International and the International Union for Conservation of Nature listed 1,227 species as threatened in 2009.
medium: watercolor and gouache on defunct Italian paper currency. 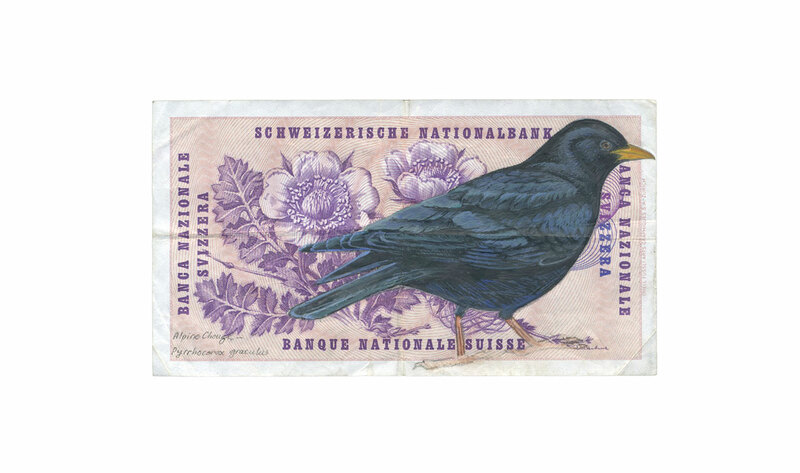 In this series, various bird species are painted onto and into defunct global paper currencies, as a means to both question and insert value. 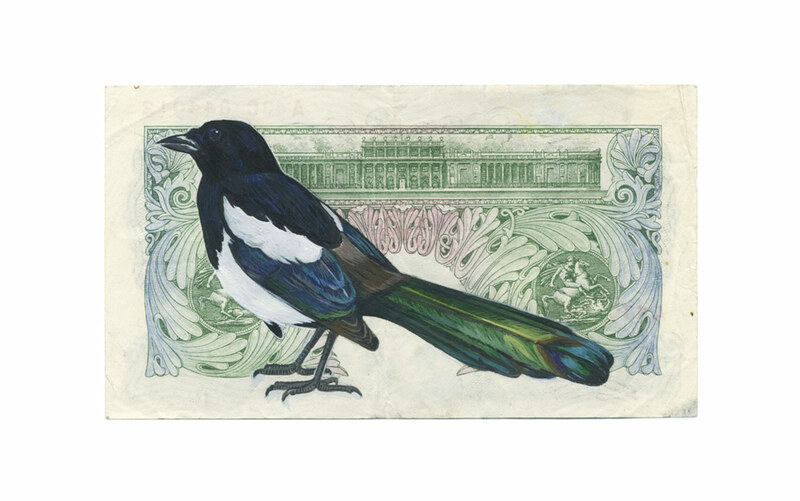 The series ask us to look beyond a purely economic perspective at the same time as it calls attention to the intricate relationship between commerce and environment. 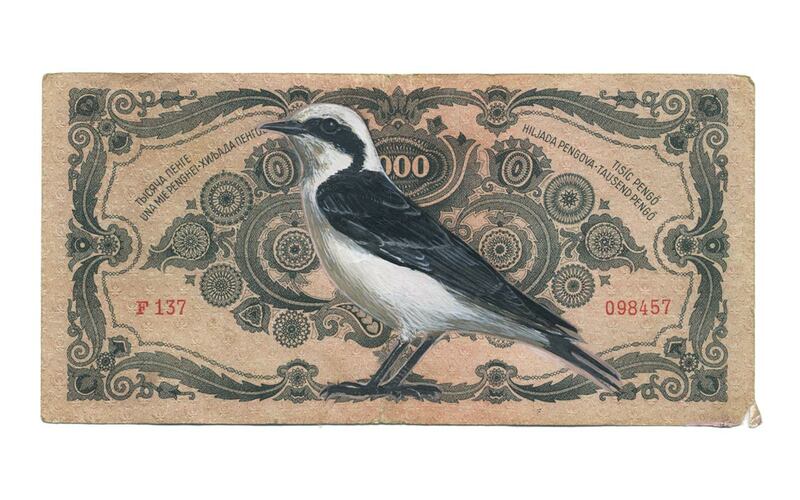 It highlights the malleability of both human territories and bird habitats, as influenced by human behavior. 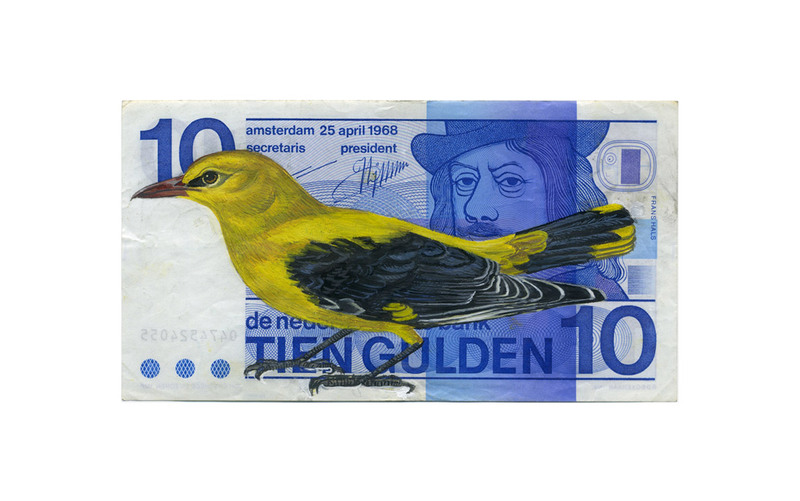 Migration and habitat, both human and avian, find uncanny resonance as Europeans struggle with an ongoing refugee crisis; and as they grapple with how to live together culturally, economically and politically, within the Eurozone. 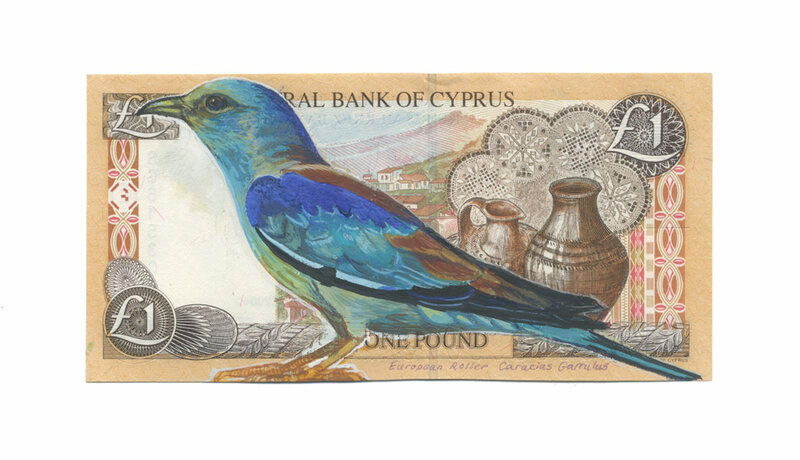 The use of defunct currency suggests the fragility, instability and changing nature of political and national identity. 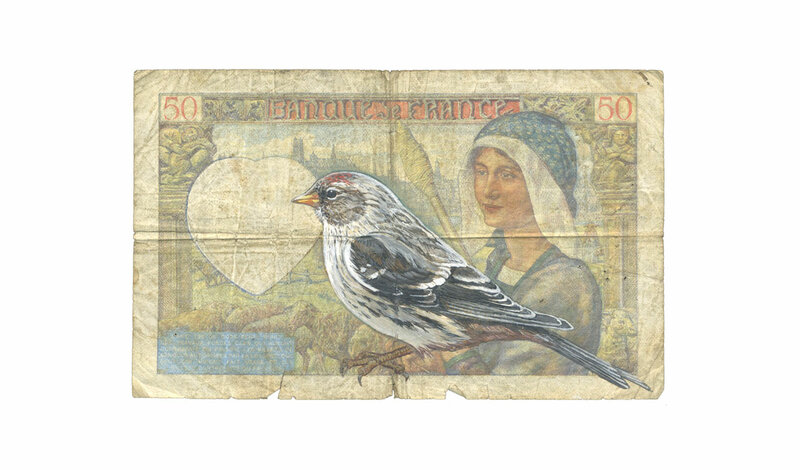 medium: watercolor and gouache on defunct Austrio-Hungarian paper currency. 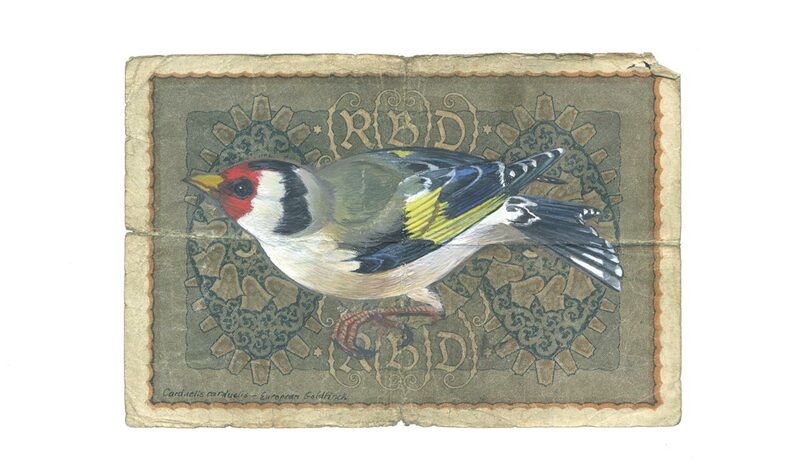 Birds have often been symbols of freedom, beauty and even peace. In this context, they inspire a desire to leave behind mere material gain for the values of a shared world. 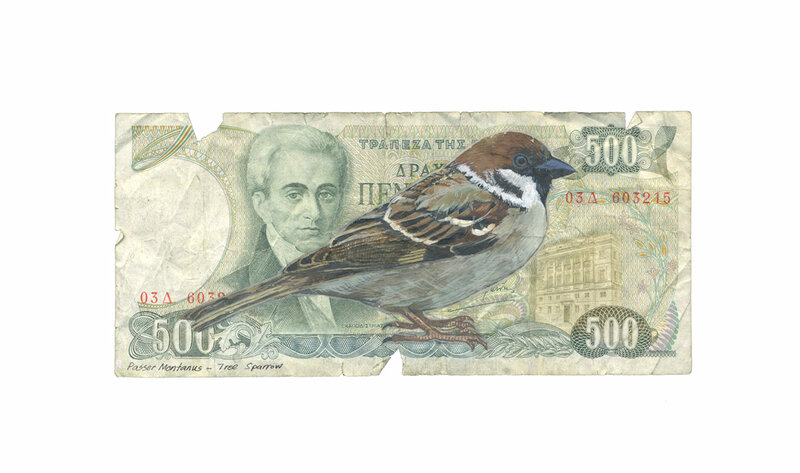 The birds act as social and environmental agents of care, beckoning us to move away from a monetary world view — to shift our thoughts beyond the money on which they perch. 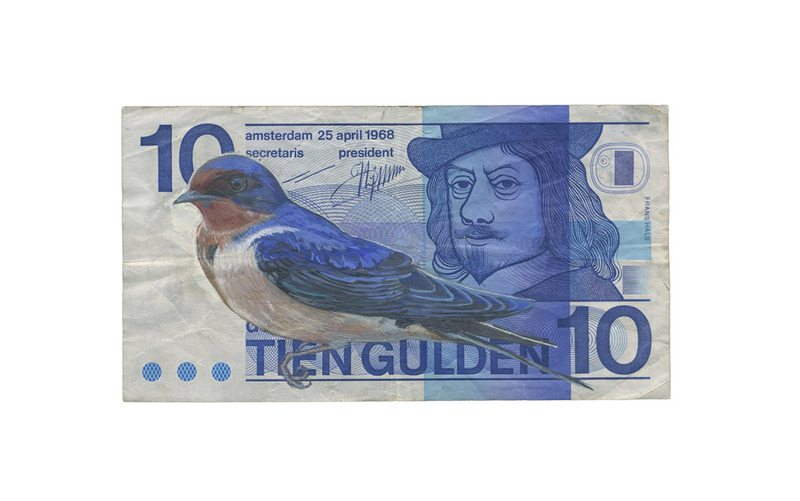 medium: watercolor and gouache on defunct paper currency from the Netherlands. 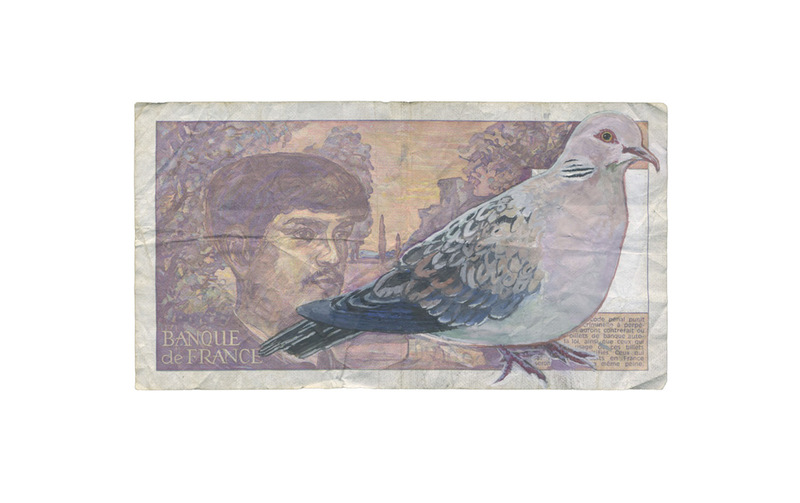 medium: watercolor and gouache on defunct French paper currency. 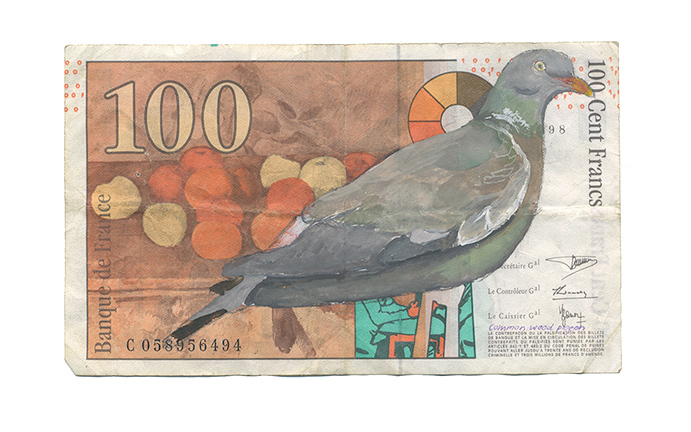 medium: watercolor and gouache on defunct Italian currency. 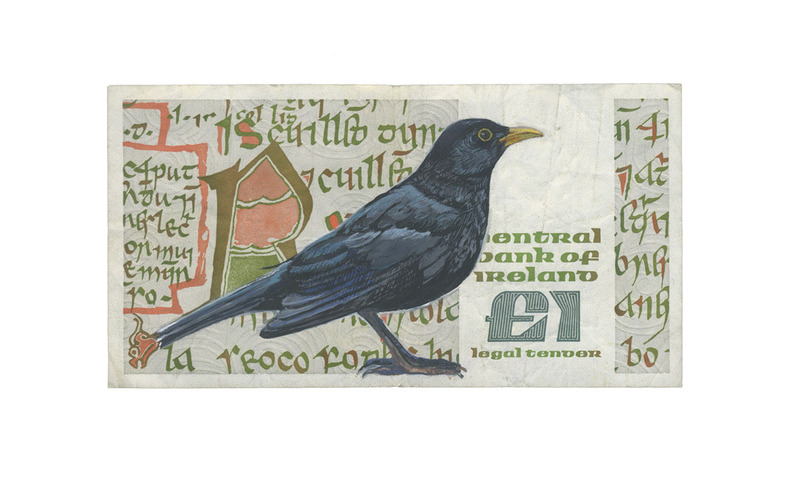 medium: watercolor and gouache on defunct English currency. 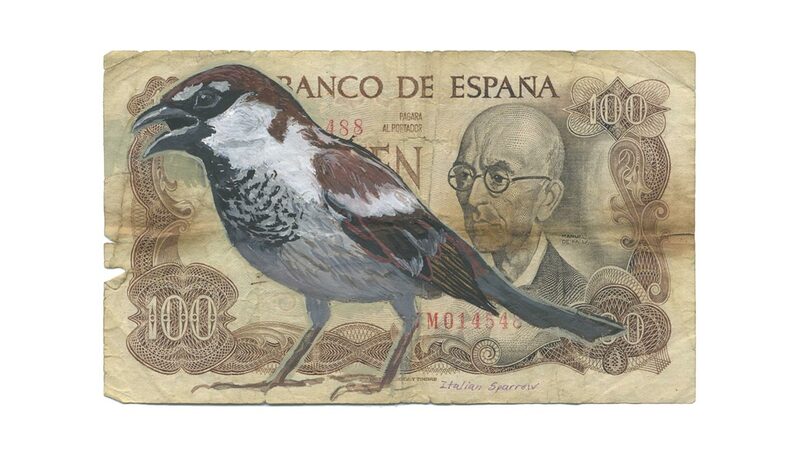 In this series, various bird species are painted onto and into defunct global paper currencies, as a means to both question and insert value. The series looks to question a purely economic perspective and the interplay between commerce and environment. 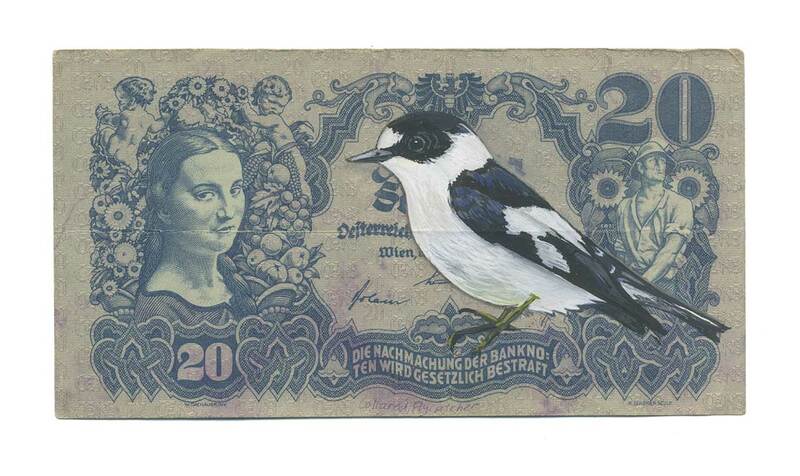 The work highlights the malleability of both human territories and bird habitats, as influenced by human behavior. 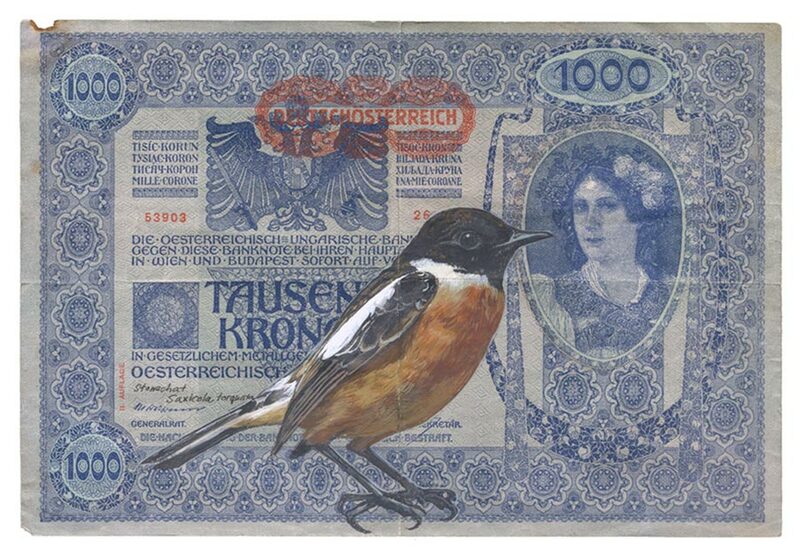 Migration and habitat, both human and avian, find uncanny resonance as Europeans struggle to define and help both migrants and refugees, and grapple to live together culturally and economically within the Eurozone and greater scope of the world.